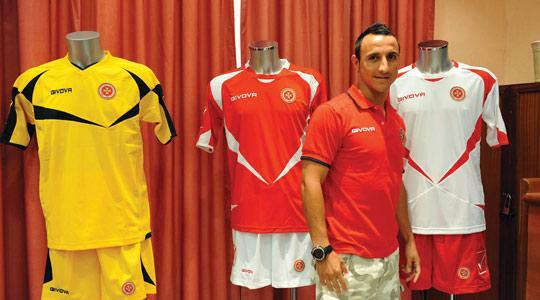 Striker Michael Mifsud shows the new Malta kits, made by givova. Malta coach John Buttigieg yesterday named his 18-man squad for Thursday's friendly match against World Cup finalists Germany in Aachen. Hibs goalkeeper Mario Muscat, Valletta midfielder Kevin Sammut, Christian Caruana, the Floriana playmaker, and Birkirkara midfielder Paul Fenech, have been left out of the squad that will check in for the Air Malta flight to Dusseldorf this morning. The likes of Gilbert Agius, who is still officially the Malta captain, Terrence Scerri, Steve Bezzina and Brian Said knew that their chances of earning a call-up were as good as nil as they didn't even figure in the provisional 22-man list. Qormi midfielder Massimo Grima has made the squad for the first time since earning a recall to the pool of national team players last year. Buttigieg has selected three foreign-based players, namely Barnsley forward Daniel Bogdanovic, Andrei Agius, the AS Melfi defender, and Ferencvaros goalkeeper Justin Haber. The friendly at the Tivoli Stadium is perhaps more important for Germany in light of their participation in the June 11-July 11 World Cup but Buttigieg stressed the need for his players to treat this high-profile match as an opportunity to improve their awareness of the demands of international football. "This is another important and useful match for us," Buttigieg said. "The friendly comes at the end of a long and hard season but we must make the most of it. "We will be playing against one of the best teams in Europe but we must rise to the challenge because in our Euro 2012 group, we must also contend with top-quality opposition. "It's an experience to be involved in this type of matches and I'm sure the players will do their best to give a positive performance." Invited to identify the reasons behind the omission of talisman Agius, Buttigieg said: "We choose those players who are in the best form and condition to represent the country. Our selection is based on the performances of the players in the domestic competitions but we're also thinking about the future of the national team." Bogdanovic missed some games for Barnsley in the latter part of the season but Buttigieg said the forward has shown no ill-effects of his hamstring problem during training. "We had been monitoring Bogdanovic's physical condition on a weekly basis," the Malta coach said. "He had a hamstring problem six to seven weeks ago. He also missed some games for Barnsley because of personal issues but looked fully fit during training." Earlier, Joe Mifsud, the MFA president, also urged the Malta players to turn in a creditable display. "This will be another prestigious friendly for our national team against Germany who will play in the World Cup finals," Dr Mifsud said. "We expect our players to leave the pitch on Thursday with their heads held high." Also during yesterday's news conference, the MFA unveiled the national team's new kits which have been produced by Italian sportswear brand givova, Malta's new technical sponsors. Dr Mifsud read out a message from Giovanni Acanfora, the managing director of givova, on the occasion of yesterday's launch. The MFA president also paid tribute to the efforts of Ivan Vella, the national teams' manager, in securing the sponsorship deal with givova who are represented in Malta by Tuttosport. The MFA president said Israel, one of Malta's opponents in Euro 2012 Group F, had asked to move their opening qualifier from Friday (Sept. 3) to Saturday. "We proposed that the game (in Israel) be brought forward to Thursday and they have accepted, pending approval by UEFA," Dr Mifsud said. Malta's U-21 and women's teams are also preparing for international assignments this month. Edwin Camilleri's U-21 side will play a friendly against Cyprus at the National Stadium on Sunday as part of their preparations for the final UEFA qualifier against Ukraine on May 29. Camilleri said the players of Valletta and Qormi are out of contention for Sunday's friendly due to their teams' forthcoming commitments in the U*Bet FA Trophy semi-finals. The women's national team will host England in a World Cup qualifier on May 20 before travelling to Austria for their June 6 encounter. Goalkeepers: J. Haber (Ferencvaros), A. Hogg (Valletta). Defenders: E. Herrera (Hibs), A. Muscat (Sliema), C. Failla (Sliema), S. Bajada (Birkirkara), K. Scicluna (Valletta), J. Caruana (Hibs), A. Agius (AS Melfi). Midfielders: M. Grima (Qormi), J. Pace (Valletta), R. Fenech (Sliema), T. Cilia (Birkirkara), R. Briffa (Valletta), I. Woods (Sliema). Forwards: M. Mifsud (Valletta), D. Bogdanovic (Barnsley), A. Cohen (Hibs).